Oat cell carcinoma, also known as small cell carcinoma, is a type of lung cancer that is characterized by small, oat-shaped malignant cells. 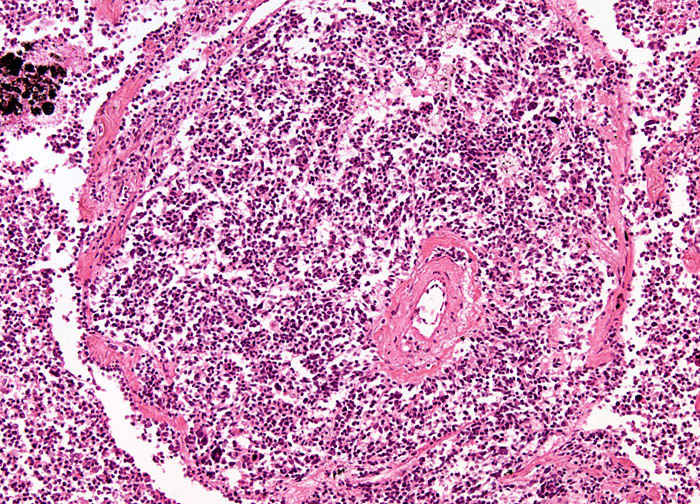 The tumors generally consist of sheets of nearly identical cells with strands of connective tissue interspersed among them. Under the microscope, it can be observed that these cells contain very little cytoplasm and have an appearance similar to normal lymphocytes, though the nuclei of the carcinoma cells are about twice the size of lymphocyte nuclei. Oat cell carcinoma is extremely aggressive and, in the majority of cases, by the time a diagnosis is made, the cancer has already metastasized to other parts of the body. Only about 30 percent of patients exhibit a limited form of the disease when they first seek medical attention.